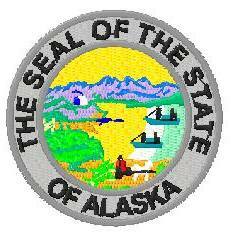 THE GREAT SEAL OF THE STATE OF ALASKA digitized for embroidery. This design is digitized in the most common tajima dst format. If you need another format you may either convert it or email us after purchase and we will convert it to most machine types. Not available in condensed. Making a copy, by any means, of TEAMLOGO.COM'S artwork or design software is a violation of copyright law. The design software is licensed to the original customer for embroidery use at one location. ©2004-2015 TEAMLOGO.COM. ALL RIGHTS RESERVED.